Most of the time when you bake with pumpkin you think of cream cheese as a frosting,I know I usually do. Brown Butter Frosting has this delicious nutty rich flavor that pairs well with pumpkin and is absolutely delicious. It makes me think of the warm spices we love so much this time of year like cinnamon and nutmeg. The frosting is easy to make, browning the butter in a saucepan is about the hardest ( if there had to be a hard part) of making it. It really just takes a little patience and a watchful eye while your melting the butter and waiting for it to turn a glorious nut brown color in the pan. The Pumpkin Cupcakes are tender and moist. The Brown Butter Frosting is smooth,creamy and delicious, a match made in cupcake heaven. 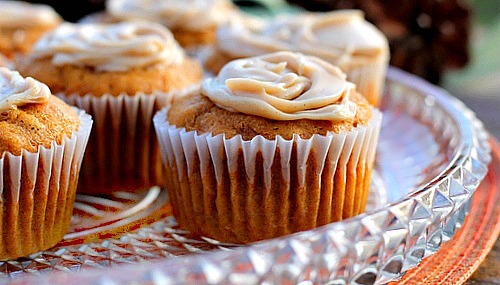 Pumpkin Cupcakes with Brown Butter Frosting … Enjoy! 2 - 4 Tablespoons milk. Preheat oven to 350 degrees. Line 2 twelve cup muffin tins with paper liners. 1. Place all dry ingredients in a large bowl, whisk to combine. 2. Place the sugar and oil in the bowl of an electric stand mixer, beat until incorporated. Scraping the bowl as needed. 3. Add the eggs one at a time, mixing well after each addition. Add the pumpkin, mix until incorporated. 4. With the mixer on low ,slowly add the dry ingredients, mixing until just incorporated. 5. Fill paper liners 3/4 full with batter. Bake at 350 degrees for about 12 minutes, rotate pans and continue to bake another 10 minutes. test with a tooth pick for doneness. remove from oven, place on a wire rack to cool. When cooled, frost cupcakes. In a medium saucepan, melt butter on low heat until butter becomes a nut brown color. This will take between 5 to 10 minutes. Do not walk away from the butter on the stove, it will turn quickly. Remove butter to a medium mixing bowl. Add powdered sugar, vanilla and 2 tablespoons of milk. Beat until smooth, adding more milk to reach a spreading consistency if necessary. Frost cupcakes. Great looking dessert here! Please feel free to send any extras over our way! Would give my right arm for one of these pumpkin cupcakes right now! Jotting down the ingredients to make SOON! The frosting, oh my gosh the frosting!! LOL! These look delicious! I love that you topped them with brown butter frosting. Brown butter anything is my favorite! YUM! Saw these at the link party and had to come check them out. I love all things pumpkin and browned butter frosting looks so indulgently delicious! Pinning! Thank you Erin! Oh the frosting!! So good I could eat it with a spoon! These look delicious! Gotta love pumpkin cupcakes! Visiting from Pinch of Joy! Thank you for visiting Jessica! Well these just look amazing! Love, love, love pumpkin and I’ll be making up a batch of these soon, yum! Oh my Mary, these look amazing! Stunning photos and great directions as always! These cupcakes look and sound delicious. 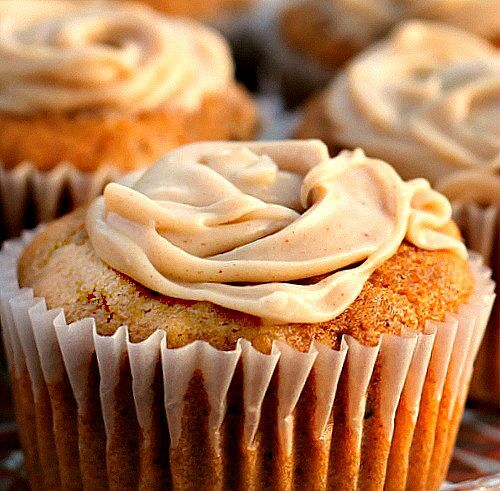 Browned Butter icing sounds like a perfect companion to Pumpkin Cupcakes. It’s delicious Susie, thanks for stopping by!